Hildegard of Bingen (1098 – 1179) shines as a beacon from the past, standing for the validity of a feminine voice and interpretation in a world where men wrote the rules and the history. Unlike many, Hildegard achieved a degree of recognition in her own times, and even more unusually left a significant body of work in thought, art, theology, visions and music that still inspires across the centuries. One of the first posts in this blog was occasioned by Hildegard’s saints’ day on 17 September 2013, the anniversary of her death. Accompanied by hurdy-gurdy and percussion, women and girls sang her Spiritui sancto from the story of Ursula and the 11,000 virgins. We have also enjoyed O rubor sanguini in years gone by. 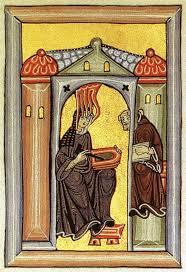 Irrespective of various viewpoints on Marian intercession, Hildegard’s inspirational value is undeniable. Gwenda will lead us in a reflection on the place of influential women in our lives and faith. Exactly how this antiphon would have been performed in the 12th century is a matter for speculation. It would have been written in neumes as shown in the manuscript at left, accessed on one of the many web resources available on Hildegard. 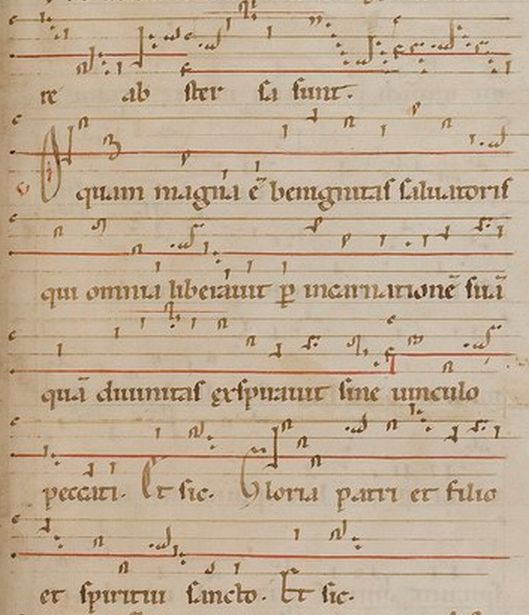 These dots and dashes indicate the pitch of the notes but not the length or duration, which probably depended on the flow of the text and local practices of the nunnery or monastery in which they were taught and sung. In any case, length and complexity preclude the performance of the full work with any pretence of authenticity and accuracy. We therefore hear extracts transcribed into modern musical notation, adapted for ease of learning and interpretation. So it won’t necessarily sound quite like this youtube clip> — but it’s recognisable and nice, and shows that Hildegard’s creativity is fruitful soil for modern interpretation. The spirit of Hildegard’s feather is more important than literal detail. The feather flew, not because of anything in itself but because the air bore it along. Thus I am a feather on the breath of God. Our women and girls gather for this rendition of the lilting poetry and chant. We are blessed that Talitha will again accompany the women’s voices on her hurdy-gurdy, a mechanical violin-like instrument which evolved before the time of Hildegard and was often used to support the monophonic melody of those times.